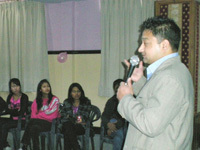 Kathmandu, December 25: “City dwellers needs to be aware and cautious about proper water management in order to avert a looming crisis,” said Prakash Amatya, Executive Director of NGO Forum for Urban Water & Sanitation, while giving orientation on water management to 24 contestants of the Miss Teen Contest 2009 to be organized by the Kathmandu Jaycees. He opined that the city could face an acute shortage of potable water in the near future if water and its sources were not managed properly. “The main cause of water scarcity today is not inadequate supply but lack of appropriate management,” he said. At present when the water utility has failed to meet the basic water requirement of the valley denizens, he suggested that rainwater harvesting could be one of the easiest and reliable ways to minimize the shortage of water in the Kathmandu Valley. Amatya also informed the contestants about ways of harvesting rainwater, its quality and benefits. “Rainwater harvesting is not only a way of addressing increasing demand for water, but also a way to preserve underground sources by recharging them,” he said. Anil Sthapit, Director, GUTHI called on the contestants to raise public awareness about water management and rainwater harvesting. Lalitpur, December 24: In the first week of December, locals of Guitole Ma Pucha were given orientation on safe drinking water to declare the area as Safe Water Zone. For this, door-to-door survey was also conducted to identify the number of households using Point of Use (POU) options and prepare a social map. Similarly, on December 24, people of Vaskervarna Ma Pucha were given orientation on safe drinking water. The orientation program was given to two groups and around 80 participants were present in the program. 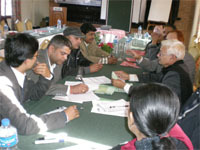 December 19, Kamalamai: A task force constituting representatives from key stakeholders on water, sanitation and health was formed at district level for water quality improvement activities of selected water supply sub-system of Siddheshwor Water Supply and Sanitation Consumers Committee in Kamalamai Municipality, Sindhuli. Under the task force, a working committee was formed with different specialties for executing water quality improvement activities. Following the formation of task force and working committee, a two-day capacity building orientation training on Water Safety Plan (WSP) was conducted in Sindhuli Madhi of the municipality. The training, which had 32 participants, focused on WSP process, monitoring and surveillance for water quality improvement, water quality analysis, point of use household water treatment techniques. 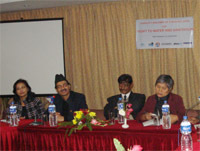 Kathmandu, December 14: NGO Forum for Urban Water and Sanitation in association with Freshwater Action Network (FAN) Nepal, WaterAid Nepal and UN HABITAT WAC Programme for the National Coalition for Sanitation and Water for ALL campaign have jointly organized a training workshop on “Capacity Building of Stakeholders for Right to Water and Sanitation”. Speaking at the event, Constituent Assembly (CA) member Hisila Yami told that there should not be any doubts and debates to incorporate safe water and improved sanitation in the new constitution of Nepal. She committed for her support in establishing water and sanitation as constitutional right. She urged media for increasing coverage for highlighting the concerns and other stakeholders to promote campaigning initiatives so that there is an increased political attention. CA member Nabindra Raj Joshi appreciated continued effort of civil society organizations in endorsing water and sanitation as constitutional right. He reiterated his commitment to continue as the champion for lobbying so that this agenda is not missed in the people’s constitution. He emphasized that civil society and state should work together to translate these rights into reality for changing sanitation and water coverage. He opined that civil society should recognize support of political leaders in establishing the right so that they are encouraged to raise people’s concerns in future. Buddha Ratna Sayami, CA member shared that the concern of water and sanitation is concern of all human beings. He raised the concern of depleting water sources and its negative hazards to human beings and environment. He shared that there should be development of federal states with equal opportunities of education and employment. The concern of sanitation and water should be considered in each and every development endeavor. Concrete suggestions from civil society organizations will be very helpful to political leaders so that they are informed more about people’s concerns and solutions to address these problems. 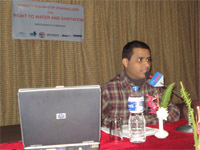 Rabin Lal Shrestha, Research and Advocacy Manager, WaterAid Nepal said, “We want right and we fight for right”. He expressed that ensuring water and sanitation as constitutional right will support in making government and state accountable to combat challenges of sanitation and water. He shared that the guarantee of right will also ensure restructuring of financial incentives so that adequate funding is allocated for the sector. He shared that there have some initiatives of capacity of policy makers so that they are more responsive towards people and their challenges. Lajana Manandhar, coordinator, FAN Nepal expressed the need for reinforcing the agenda of sanitation and water in the constitution of Nepal. She shared that these are the voices of civil society with strong back up from rural and marginalized communities. She demanded that the state should be responsible for reinstate right of people to ensure their dignified lives. Solidarity of the civil society will be continued for raising the concern of the people so that policy makers could hear them loud and clear. Basant Prasad Adhikari, Advocate, shared on water and sanitation right in preliminary constitution. Right to sanitation and water is not an unique feature, it has been recognized in several countries including Uruguay, South Africa, Bangladesh, Honduras, Bolivia, Algeria, Kenya, Iran, Colombia, etc. Establishment of the right will support in claiming right with entitlement. It will add advocacy value so that the campaigners could influence policy makers in stronger manner. He emphasized on need of separate right to sanitation as it will not dilute efforts for the sector. He also shared CA procedure of decision, timeline and potential advocacy initiative that could be carried by civil society. Kathmandu, December 11: Arati Chaudhary, research intern at NGO Forum, has received research grant from New ERA Pvt. Ltd. in subject–offer of Dr. Harka Gurung Fellowship 2009, for the partial fulfillment of her Masters Degree in Environmental Management from School of Environmental Management and Sustainable Development (SchEMS) College. Chaudhary will be conducting research on “Impact of urban growth on traditional stonespout as an alternative drinking water source in Bhaktapur municipality”. She informed that her study intends to analyze the urban impact on traditional stone spouts and to secure the sustainability of water supply from the sources. She further explained that the research will help to find out the settlement growth over time in the municipality area and state of dependency on traditional water source. Dhulikhel, December 10: Environment and Public Health Organization (ENPHO) organized a half-day orientation program on School Led Total Sanitation for the 191 local people and students of Kalidevi Primary School and Mandaladevi Primary School. Different success stories were shared and the documentary “Safaltako Katha” (A story of success) was shown to make them realize that toilet can also be constructed with local resources. Colloidal silver filter was distributed to 3 schools—5 filters in Mandalidevi Primary School, 2 in Shree Kalidevi Primary School and 2 in Chayal Devi Primary School—in order to provide safe water in schools. Shree Kali Devi Primary school became the first Open Defecation Free School, which had initiated School Led Total Sanitation Campaign with support from Urban Environment Improvement Project, Japan Water Forum and ENPHO. Similarly, 66 local people participated in the Stonespout Clean up Campaign organized in coordination with Bottlers Nepal Limited and ENPHO on December 10, 2009 in Itole community of Dhulikhel Municipality. Lalitpur, December 5: Centre for Integrated Urban Development in coordination with the local school students and financial support from World Vision International Nepal, ADP Lalitpur organized street Drama in Harisiddhi and Thaiba VDCs to spread public awareness on sanitation issues in community through capacity building of local students. The professional artists from Youth Front Nepal selected and trained the students from Harisiddhi Higher Secondary school of Harisiddhi and Pulchowki Higher Secondary school of Thaiba. Community people gathered around to enjoy the drama. There was interaction between participants and artists at the end of the drama, which was very effective. The drama circulated the sanitation related messages to the community. The drama will be conducted in other VDCs in future. 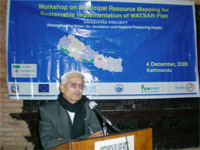 Kathmandu, December 4: Municipal Association of Nepal (MuAN), Practical Action Network (PAN) and Environment and Public Health Organization (ENPHO) with support of UN HABITAT Water for Asian Cities Programme Nepal and European Union organized a workshop on municipal resource mapping for sustainable implementation of WATSAN plan in Kathmandu. The joint venture of these organizations have been conducting the "Strengthening Water, Air, Sanitation and Hygiene Treasuring Health (SWASHTHA)" project in selected seven municipalities including Bharatpur, Ratnanagar, Butwal, Ramgram, Siddharthanagar, Gulariya and Tikapur; and 3 small towns namely Sunawol, Kawasoti and Bardaghat to access improved drinking water and sanitation (WATSAN) facilities to the poor clusters in these areas. The project has recently formulated a 20-year WATSAN Plan. It has recommended various WATSAN activities to conduct in selected poor communities of these municipalities and small towns, which requires sufficient fund support. The resource mapping workshop had been held to identify the possible resources, which can be supportive to implement WATSAN plan in the project areas. The workshop carried out stakeholders' consultation on existing WATSAN situation in municipalities, various constraints to bring additional support from other potential stakeholders and donors. The workshop also focused on role of different level sector players in the implementation of WATSAN plan, and exploration of possible financial and other resources. Speaking at the workshop, Joint Secretary at Ministry of Local Development (MoLD) Dinesh Thapaliya told that population living under poverty line has increased in the country in last few decades though it seems reduced in proportion. Speaking about the small scale grants, he opined that MoLD should provide grant to those local governments, which assure the ministry to give prime consideration to water, sanitation and health sector. Dormani Poudel, president of MuAN told that local government should place solid waste management at top priority position in their action plan at the time of approaching to the donors. He suggested the participating municipal representatives and WATSAN stakeholders to get united to contribute WATSAN sector. Highlighting the existing urban WATSAN problems and current strategies of local governments, the participants at the workshop suggested for making local government accountable and capable to implement WATSAN activities independently. They also suggested for assembling support from various resources for the effective implementation of WATSAN action plans at local level.